You can’t read the Sermon on the Mount (Matt. Ch. 5 – 7) without coming away disturbed. Perhaps that’s why we don’t hear too much sermonizing based on Jesus’ longest sermon (and perhaps his only sermon recorded in the Gospels if you count Luke’s version as a different telling of the same sermon). We don’t hear many sermons based on these words because in the Sermon on the Mount, Jesus seems to be promoting what some people might call ‘works righteousness.’ Throughout the sermon, Jesus tells his hearers that God will treat them exactly how they treat others. In his comment on prayer, for example, Jesus directly links our forgiveness by God to our forgiveness of others: “If you forgive men their trespasses, your heavenly Father will also forgive you. But if you do not forgive men their trespasses, neither will your Father forgive you.” And this teaching on forgiveness, which is actually part of Jesus’ advice on prayer, is part of three activities that Jesus assumes we will do. And how we do these three activities, again, determines how God responds to us. Notice, Jesus says “when you do charitable deeds…” “When you pray…” and “when you fast…” Jesus is assuming that we will be doing these things. Prayer, fasting and charitable acts are not optional for followers of Jesus—it is what identifies them, at least according to Jesus. Notice also, with each of these three activities, after Jesus gives some specific instructions about how these are to be done (and not done), he adds that they must all be done in secret. And whether or not they are done in secret determines whether or not God rewards. I mentioned this in an earlier blog, but it bears repeating here: the word ‘openly’, as in “and God will reward you openly,” does not appear in the earliest and best manuscripts. The contrast is not secret versus open (i.e. secret prayer resulting in an open reward) but rather the contrast is between secret and reward (any reward). But lest any of us be thrown off by that word, “reward,” as though a reward were something extra given and not actually contingent on anything we have done, we should notice that the Greek word misthos that is translated as ‘reward’ in these verses is much more commonly and appropriately translated ‘wages’ or ‘hire’, as in “a labourer is worthy of his hire” (Luke 10: 7 & 1 Tim. 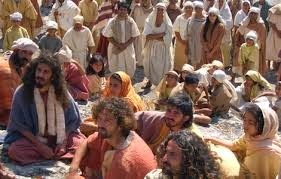 5:18) and “Behold, the wages of the labourers who have mowed your fields…” (James 5:4). As distasteful as this may sound to our ears, the following is a perfectly legitimate translation of these verses: “That your charitable deed may be in secret; and your Father who sees in secret will pay you out.” As I said above, if you are going to read Jesus’ sermon for what he actually says, it sounds a lot like what some would call ‘works righteousness.’ In fact, it is probably to avoid sounding this way, the word ‘reward’ is used. Another word that is conveniently mistranslated in these passages is the word ‘charitable deeds.’ In Greek neither the word ‘charity’ nor ‘alms’ appears. The Greek word here is dikaiosune or ‘righteousnesses’, or ‘righteous deeds’. So really, what Jesus is saying is that God the Father pays out for righteous deeds done in secret. No wonder we don’t hear too much preaching from the Sermon on the Mount! So what do we do with this? Do we have a conflict between Jesus and St. Paul? Is Jesus preaching salvation by works righteousness while St. Paul is preaching salvation by faith? Actually, I have read some scholars who argue this very position, but I think they are totally off the mark. The problem lies, in my opinion, in the very concept of salvation, what it is and how we obtain it. If we have a juridical understanding of salvation, as though it were a thing given to us, then we might get caught up in wondering on what basis this thing is given to us. And if we think of salvation merely as the forgiveness of sins and the imputation of righteousness to us in some heavenly accounting system (rather than in our lives as they are actually lived and experienced), then we might split hairs over at exactly what point and on what basis such legal standing is granted us. And if we understand the judgement of God to be the opening of this heavenly accounting system (the books) to reveal who made it into heaven and who didn’t—as opposed to the opening of the books referring to the opening of our conscience, the revelation of all that we have done, lusted after and hated or loved and served in the secret of our hearts—if we think judgement is just about who made it in rather than a revelation of who and what we are already, who or what we have become in this life, who or what we have longed to be, if judgement is just about accounting, then of course, how we live our lives and how we cooperate with or resist the Grace of God in our transformation in this life would certainly be irrelevant. But it is not irrelevant, rather it is the ‘whole enchilada’ to use a phrase some monastic friends of mine like. Our transformation into Christ’s image is the reason for everything. And this, of course, is the whole point made by St. James. Faith and works are not separate. Certainly, faith precedes works in one sense, but this preceding faith, if not followed by action, is not faith at all, it is empty, it is dead. Even in St. Paul’s famous argument in Romans chapter four, based on the righteousness of Abraham, faith is accompanied by an action and that action is a sign of the reality of the faith. Abraham is given the sign of circumcision, “a seal of the righteousness of the faith which he had while still uncircumcised” (Rom. 4:11). But what if Abraham decided to pass on the circumcision? What would that say of his faith—or lack thereof? It is the action, or the ‘work’, that fulfills the faith, that reveals that the faith is indeed real. As St. James puts it, “Was not Abraham our father justified by works when he offered his son on the altar? Do you see that faith was working together with his works, and by works faith is made perfect?” (James 2: 21, 22). Since the goal of the Christian life is to be transformed into the image of Christ (not to get into heaven by making sure your name is on the right list in the heavenly accounting books), and since the final judgement has to do with the revealing of the secret things written on our conscience, then it makes sense that Jesus would emphasise certain key dispositions, certain key attitudes and actions that are to come from a secret place within us, from our hearts: come from our hearts and be manifested in our actions. Faith is essential, for without faith we would not move toward God at all: “For he who comes to God must [first] believe that He is, and that He is a rewarder of those who diligently seek him.” Oh! And there’s that Greek word again, now in its participle form, misthanpodotes. God pays out to those who diligently seek him. And so to return to the Sermon on the Mount, what is the pay out, what does God give us both in this age and the Age to Come? According to Jesus, God gives us what we give others, or treats us as we treat others. You might say that God gives us what we want, what we really want secretly in our hearts. Do we want mercy, then we show mercy to others and God shows mercy to us. Do we want forgiveness, then we forgive others and God forgives us. Do we want a genuine relationship with God in our hearts, then we pray in secret—in our hearts, and God rewards us by dwelling secretly in our hearts by faith. Do we want to love Christ and receive his love, then we love our neighbour, we do to others as we want God, who is the ultimate Other, to do to us. Isn’t this also what is revealed to us by the psalmist when he says, “With the holy, You show Yourself holy; with the innocent, You show Yourself innocent; with the pure, You show Yourself pure; but with the perverse, You show Yourself perverse [or shrewd, if we don’t like the idea of God being perverse, but that is, nonetheless, the parallelism] (Psa. 18: 25, 26). For too many of us, the words of Jesus have not been taken seriously because we have not believed that they really matter. Too many of us have held understandings of salvation that somehow only value the fact that Jesus died on the Precious and Life-giving Cross [as some sort of a credit in a heavenly accounting system]; but we pay little heed to what Jesus actually said, as though what Jesus said has nothing to do with what He did. But I don’t think that is the case. In fact, I think it is rather foolish to think such a thing. How Do I Become Poor In Spirit?